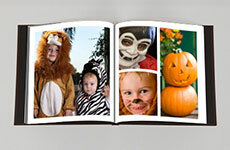 Halloween is an ideal subject for a customized photo book. Now is the perfect time to start thinking about your one-of-a-kind Halloween Photo Book. You’ll discover that the possibilities are endless! Not only will your photos allow you to tell a great story, they can help you tell it with captivating seasonal style! From candy-filled little fists to homemade costumes, your seasonal photo book will be the perfect treat to give to yourself for remembrance of these special times with your children and to give family members as an heirloom to cherish! Think about how you want to tell your story. Is this the first Halloween in the new house? Are you trick-or-treating as a family or with friends? Will you have a little group of super-heroes, or scary goblins, or pretty princesses? No matter what your children want to dress-up as, there is a potential theme for your custom photo book. Costumes can help you tell your story and may even provide title possibilities like: “Little Witch’s Quest for M&Ms,” “Batman’s Bat Cave Halloween Party,” or “Red Riding Hood Visits Grandma for Halloween.” Photographs of children trick-or-treating, bobbing for apples, or simply kicking the fall leaves while in their costumes can be priceless entries for your photo book. You can tell a story that captures the delights of the holiday or showcases the various events of a school Halloween party. Your custom photo book allows you to be the storyteller and create a meaningful tale that you and your little trick-or-treaters can share for a lifetime. It helps to think about how you want your story to start – perhaps with shopping for costumes. The middle of your story could be a series of candid shots of the kids as they trick-or-treat throughout the neighborhood. And your Halloween photo book could end with all the kids sorting and trading their candy at the end of the night. For visual interest, mix extreme close-up shots with traditional trick-or-treating at the door shots: little hands clutching candy, a tight shot on a sticky face, the piles of candy at the end of the night, etc. You can describe each photo in your book with a few words or a few sentences. If you are not comfortable writing, think about using lines from a favorite Halloween story or recount a classic Halloween poem or pair pictures with creepy quotes from Edgar Allan Poe! It’s your book and you can tell your story anyway you like! If you plan to use captions, make sure to select this option when you select your template type for your Halloween Photo Book. Designing a photo book can truly conjure up the artist in you! Capture the spirit of the occasion by working with black and white or sepia colored photographs. This photo technique can be especially effective for photographs with distinct silhouettes of monstrous masks and creepy costumes! Setting plays a large role for a Halloween photo book, but you can have fun by creating some over-the-top scenes that truly depict your Halloween spirit! If you happen to live in an area that naturally transforms into that classic fall scene—autumn-colored leaves, overcast skies, and windswept fields, you might already have the perfect backdrop for your photographs. On the other hand, you can complement the natural scenery of the season by adding various thematic props to your photographs. Scarecrows, carved pumpkins, black cats, witch hats, hanging skeletons, eerie ghosts—use these items to set the stage for taking your pictures. Having an adult costume party for Halloween? Don’t miss this opportunity to capture your friends at their beastly best. All the same principles apply. Have fun, mix it is up when it comes to close-ups, settings, props and candid photos. Most of all, have FUN! Once you get the hang of telling a story with a custom photo book, we think you’ll be hooked and want to fill your bookshelves with photo books for every special occasion! So get your creative juices flowing with a bowl of candy corn and some mulled apple cider and start planning your eerily terrific Halloween photo book!